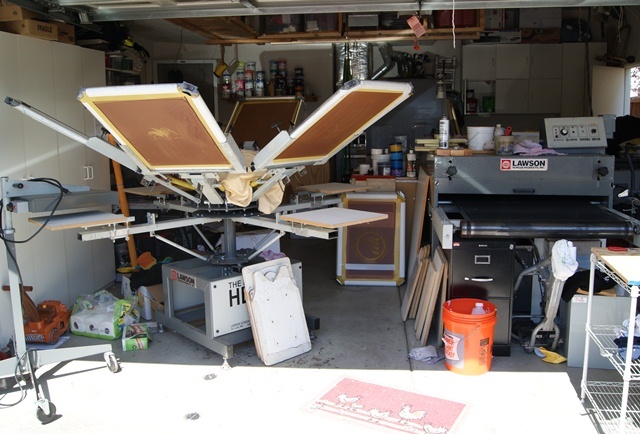 This is a complete turn key screen printing shop with everything you need to print up to 6 colors with Waterbase, Waterbase Discharge or regular Plastisol inks. SOLD AS COMPLETE PACKAGE ONLY! Everything is currently up and running in perfect working order. The Exposure unit will handle two 23x31 frames or 4 18x20's. The bulbs have been updated with high output (365nano) Unfiltered UV lights for a quick and precise screen burn. I can hold 5% dots and do fine tonal printing with this exposure unit and Ulano 925WR emulsion. The dryer is the 3610 model and has the dual forced air option. This allows you to cure waterbase discharge with ease. (I print mostly waterbase and is the reason I got this dryer in the first place. It's 3 wire 230v and requires a 60amp breaker that I will pull from my breaker box along with the main power line that runs from the breaker box. The manual press has been leveled and paralleled for precise off-contact printing with custom shirt boards in a bunch of sizes. Each screen holder will handle 23x31 frames. I have plenty of platens to handle 19x23 to custom care tags. There is plenty of blank material to cut any size shirt board you could want also. Wash tank comes with a pressure washer and all the cleaning chemicals I have left. Flash unit could use a new cord but works fine as is. Includes Newman Roller Frames and screen cabinets with Mesh tensioned to 40 newtons with almost a full gallon of Ulano 925WR emulsion to coat your screens. I also have a dozen aluminum static frames with no mesh in them you're welcome to have. An HP R1800 inkjet printer with all black dye ink carts and a roll of film for making your film positives. You will need a RIP as I'm keeping my copy for future use. I can and do print 5% dots with this setup, and so can you. Waterbase inks are from Matsui with most of all the pigments and some brite base and regular base. I also have 2 gallons of the CCI D-White plus activator. Plastisol inks are Wilflex EPIC MX Phalate compliant inks in the complete quart mixing kit with Quick White and Sprint whites for your cotton and cotton/poly blends. Selling due to moving and don't have space to put the shop at the new house. your advert and i have seen the complete screen printing shop of which i am interested in and i am presently in the Gambia and i don't know if it's possible to get them down here. I really want to get full detail about the transaction. Ship it to Gambia... not going to happen. why is it not possible ?